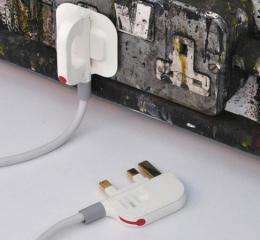 (PhysOrg.com) -- A design student, frustrated at having his brand new wafer-thin laptop scratched by the unwieldy and bulky plug attached to it, set about re-designing the standard British 3-pin plug that has remained unchanged for over six decades, and invented a plug that folds to a mere one centimeter thickness. Min-Kyu Choi, a design student from the Royal College of Art in London, won the 2010 Brit Insurance international award for Design of the Year with his folding plug, beating 90 rivals including fashion designer Alexander McQueen’s last collection, a twin-seat electric aircraft from China, and a social housing project from Monterrey in Mexico. Mr Choi said he was disappointed when he bought his MacBook Air slimline laptop, which is thin enough to fit in an envelope, only to find a bulky 4.5 cm plug attached to it. The design of the British three-pin electrical plugs has remained unchanged since it was standardized in 1946. He said when he found the computer had been scratched by the plug on a trip to the university he decided to design a plug that could fold flat to make it almost as thin as the laptop, and to prevent the pins causing damage. The UK Folding Plug transforms from a bulky three-pin plug into a portable, hassle-free plug ideal for people on the go. The design of the lower section allows it to be rotated 90 degrees so the two pins are parallel with the top pin, making the unit less than 10 mm thick and able to be tucked easily in a laptop bag. The design is fully protected by patents and it meets the British Standard regulations, and like the ordinary British plug, contains an easily replaceable fuse. 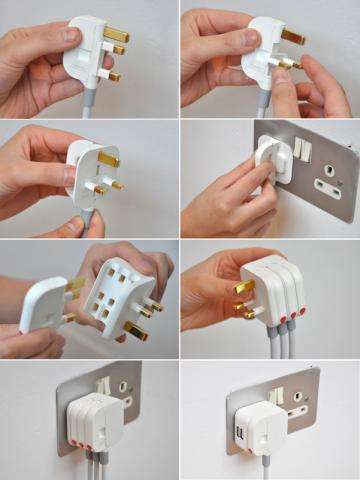 Mr Choi has also designed an adaptor the same size as a standard British plug that takes three of the folding plugs. Artist Antony Gormley, who was chairman of the award judging panel, said the plug was an elegant design that had been thought through and was modest and responsive, and “could make a difference to everyone’s life.” It is also likely to make Mr Choi extremely wealthy if it is well marketed. The folding plug will be officially launched later this year, and will remain on show at the Design Museum in London until 31 October. I'm not so sure this is an original idea. I think I've seen something like this from way back in the 80s. They said he got a patent though, so maybe you saw the idea not get followed through. 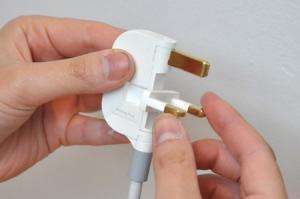 Big 'gotchas' with UK plugs are isolation of pins and re-wireability. I *hope* this design endures. I think that those plugs could come with non-detachable cables to keep them secured to those devices that need to have mains voltage but only tiny current, like chargers. That way the possibility to use them for big loads is reduced. The most important part is that you can use it in its flat state, making a transition to this new flat plug possible so when most sockets are adapted in X years they can make cheaper fixed flat ones. i'm currently on a round the world trip and would have loved to have this attached to my laptop...i really hope it takes off! The BS 1363 standard was introduced in 1947, one of its main objectives was to end child deaths due to electrocution from plugs and sockets, it has succeeded brilliantly. There are two very obvious errors in the Folding Plug design (quite apart from whether the moving parts are up to doing the job). The safety barrier in this design is optional; you do not have to fold out the sides to be able to insert the plug. That is unacceptable, safety must be inherent. The standard requires 9.5mm from pins to periphery of the plug; this design has 3mm along the length of the rotating part and 0mm at the ends. The other obvious error is that access to the fuse must be impossible when the plug is in use, this has the fuse accessible at all times. BS 1363 and the Plugs and Sockets regs are in place to stop dangerous products being foisted on the unwary by the ignorant. Folding Plug has been awarded several prestigious design awards, a sorry reflection on the values of our society. It's very easy to criticise without offering solutions. How about http://www.slimplug.com/ which is real, meets standards and is available to purchase? or, http://www.thinplug.com/ which is expected to be available before long. With two designs of folding plug from competing companies who have both demonstrated that they understand the real issues why does anyone need a ill-conceived unsafe piece of nonsense like Min-Kyu Choi's?